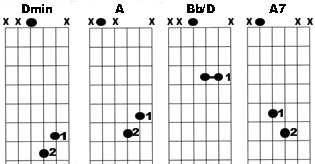 Another example of 3 note voicings - this time of fairly basic chords. This way of playing these chords allows me to put a slide down on the end of each phrase. It would also allow for other effects like vibrato or bending the notes a bit. Make up your own!